Simplicity doesn’t mean you have to skip the flavor. These scrumptious Thai Chicken Lettuce Cups deliver on both! Use your secret weapon - the MultiPot Pressure Cooker, to quickly get dinner on the table and into tummies. The bold flavors in this dish come from the Thai-style chili paste. It is a concentrated blend of red chilies and Thai spices. The heat is balanced by the sweetness of the coconut milk and honey. As a final flourish, chopped peanuts are sprinkled on top for crunch and cilantro leaves add a fresh burst to every bite. Stir peanut butter, honey, garlic, lime juice, coconut milk, rice wine vinegar, soy sauce, and chili paste together in the pot of a pressure cooker until smooth; add the chicken breast halves and press into the sauce to submerge. Select Pressure Cook (Manual) and cook for 15 minutes on High pressure. Remove chicken to a cutting board; shred with 2 forks. Return shredded chicken to the pot and stir into the sauce. 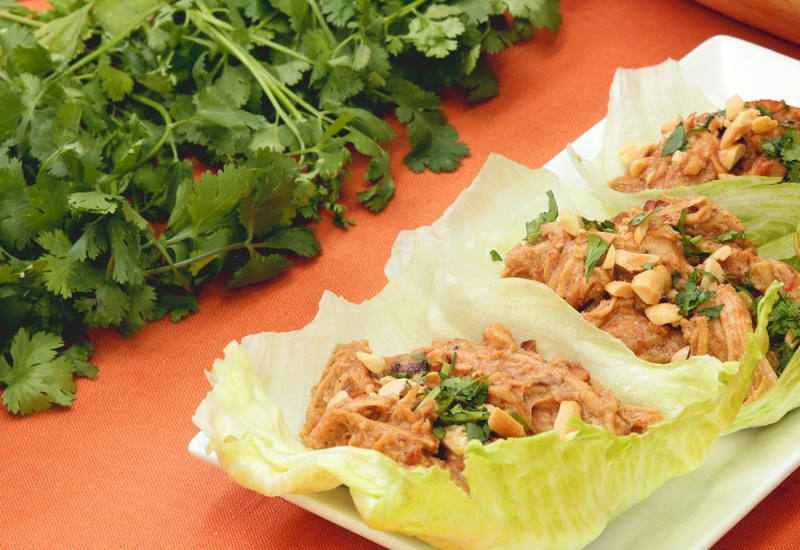 Spoon chicken into the center of lettuce leaves; garnish with chopped peanuts and cilantro to serve. If you like a little more spice, add 1/2 teaspoon red pepper flakes to the peanut butter mixture. Bibb lettuce is a variety of butterhead lettuce that has crisp dark-green leaves. Their delicate curved shape is the perfect "cup" shape to hold the shredded Thai chicken. Per Serving: 845 calories; 50g fat; 34.6g carbohydrates; 71g protein; 145mg cholesterol; 1245mg sodium. So easy and tasty! We put it over some leftover plain noodles for quick, filling dinner (yes, weird, but worked). Next time I'll throw some carrots and broccoli into the pot during the last half hour and serve it over brown rice. Thai-style peanut sauce is among my favorite food things in the world! Made this for dinner. The boys loved the idea of making tacos out of lettuce leaves. Next day, took the leftover chicken and tossed with spiralized cucumber and spaghetti. Was only okay but mostly because it needed more sauce, which is easily enough remedied. If you've had these types of sauce and enjoyed, you'll like this. If not and you like peanut butter at all, you should try this. It's a very accessible version of a common sauce you'll learn to love. flavor was great, but 4 stars bc my chicken burnt a tiny bit to the bottom of the pan and it was tough to clean off. This was really easy and turned out great! Even my picky toddler, who never eats anything, wanted seconds. I think it was because the peanut butter is such a familiar flavor that it worked so well. I always order thai chicken lettuce wraps when I eat out and now I can make them at home! This recipe is perfect, tastes better than in the restaurant! The Thai chili paste wasn't too spicy and the chopped peanuts gave it a nice crunch. Love! You had me at peanut butter! Loved the texture and flavor in this dish. I don't usually buy chunky peanut butter, but I'm so glad I tried something new because it came out great. I definitely would have been missing out if I used creamy peanut butter. This was super easy, and so delicious. We also served it with tortillas. I preferred with the lettuce cups, but some liked the tortillas. I will be making this again, and would also be great as a meal prep for lunches. These are delicious! As usual, I’ll make a few adjustments for my specific tastes next time. Like adding more spice. The amount of baked on mess to clean up was disappointing. I put some vinegar and water in the pan and pressure cooked for a few minutes which loosened the gunk off the pan and reduced the amount of scrubbing. I followed the recipe however the chicken was burnt. The flavor is good! I added peppers at the end. Just remember to add extra liquid to avoid burnt chicken. The sauce is too thick and caused multiple burn warnings and so I released pressure to stir once and add more coconut milk which slowed things down. The garlic and chilly paste both burned on the bottom of the pot. Taste was ok, but some burned bitter flavors going on.